This 2018 February Sumatra Tour visits Bukit Lawang, Batu Katak, Batu Kapal, Selang Pangeran and Tangkahan over 13 days. 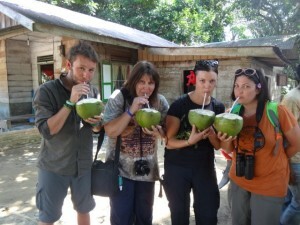 13 Days 12 Nights – The Real North Sumatra. 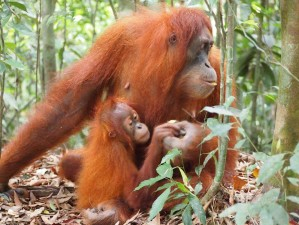 Bukit Lawang, Batu Katak, Batu Kapal, Tangkahan, Village to Village Trek, Volunteering Opportunities, Elephants, Orangutans, Hot Springs, Market Visit, Cooking Class and more…. DAY 1. SUN 4 FEB. Pick up from airport Kuala Namu Airport at 4.00 pm (or earlier from your hotel on the way to the airport). 4 hour long drive to Batu Katak. Arrive around 9.30pm. Accommodation Batu Katak Guest House. Day 3. TUES 6 FEB. 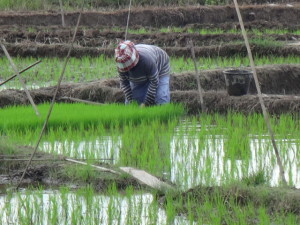 Walk or motor bike today to Selang Pangeran (3.5 hour river walk) past villages, rivers and farm land to Selang Pangeran. Afternoon to relax and explore river. Afternoon help with English lessons.. Volunteer accommodation Selang Pangeran. Day 4. WED 7 FEB. Volunteer activities today. Visit waterfall near Selang Pangeran (100.000 IDR pp) in morning. Afternoon meet the children and help teach English to local children 2-4pm.Pack for a purpose school supplies optional. Accommodation Selang Pangeran. Or head off to Batu Kapal late afternoon by bike or walking. Day5. THURS 8 FEB. In the morning motor bike or walk to Batu Kapal. Arrive late morning. Day 7. SAT 10 FEB. Optional day trip (cost extra) to visit the second largest waterfall in Sumatra – full day trip by car including lunch or have a free day to relax and explore the village and river. Min two people per activity. Tonight live music in village. 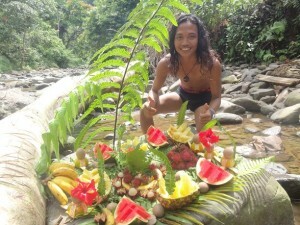 Accommodation Batu Mandi Bukit Lawang. Day 10. Tues 13 FEB. Free day to relax and swim in river .Optional activities (cost extra). Morning Art lesson or afternoon cooking class for shared dinner. Explore and relax in the river. Guitar in the evening. Day 11. Wed 14 FEB. 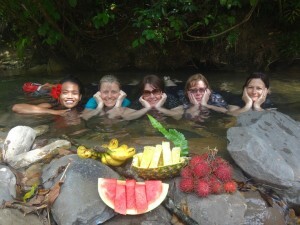 Hot springs and waterfall – full day trip by 4WD including lunch.